Consider a well-oiled machine—its mechanical precision, its efficiency, its agility. No wonder Friday’s concert at Orchestra Hall, featuring Wynton Marsalis and the Jazz at Lincoln Center Orchestra (JLCO), completely sold out—even with extra seating on stage behind the musicians. 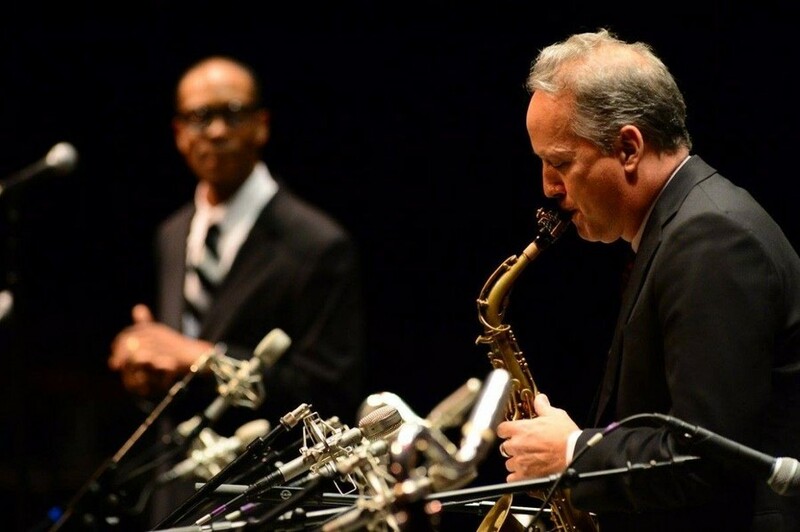 As part of the Symphony Center Presents Jazz series, which features some of the most famous jazz musicians alive, Friday evening’s concert resembled a sonic version of a Maserati effortlessly flying down an impeccably paved highway. The JLCO has perfected jazz to a level of acute precision. Every gear is oiled, every detail finely polished, and the engine fueled by some of the finest diesel: Wynton Marsalis himself. One of the most successful musicians of our time, Marsalis is a master trumpeter in every sense of the word. Few musicians are as virtuosic in multiple genres—he is the only musician to have won classical and jazz Grammys in the same year, and he’s done so twice—and he brings that virtuosity in directing the JLCO. Friday’s performance was a continuation of the group’s recent series of New York performances, “Jazz in the Key of Life.” The band played pop music from the ’30s to ’80s, including selections like the ’30s classic “For All We Know” and music by Stevie Wonder. Each song was arranged by a band member, resulting in unique, creative arrangements of songs that otherwise would have been harmonically monotonous for a group of such talent. The group’s opening, “Streetlife” by the Crusaders, was surprisingly jarring, with a strange disconnect between the rhythm and horn sections. However, like any high-quality machine, they immediately corrected course and remained on track for the rest of the evening, with just a few tuning issues in the trombone section interspersed throughout the night. One of the most exciting pieces was “Eleanor Rigby,” arranged by saxophonist Ted Nash. What started out as a seemingly standard big-band arrangement of a pop tune quickly evolved into something wonderful. During the tenor saxophone solo, the group shifted grooves—I almost thought I was hearing a fresh, contemporary jazz composition rather than a Beatles classic. Bravo, Mr. Nash. Another exciting arrangement was Crosby, Stills, and Nash’s “Wooden Ships” by trombonist Vincent Gardner, who also acted as the evening’s music director. The tune opened with each instrumental family moving differently, resulting in a rhythmic variation that was slightly unsettling and endlessly exciting. On another piece, Stevie Wonder’s “Another Star,” the ever-formidable clarinet player Victor Goines took a lengthy solo. I was disappointed that the amplification onstage took a toll on his performance, turning his warm tone shrill and thin. The only caveat to an ensemble embodying such perfection is that it can sometimes result in a loss of character. A Lamborghini is beautiful and effortless in all things, but does it have as much personality as a 20-year-old Subaru that’s schlepped across the country, blanketed in bumper stickers acquired over its two decades? There were moments in the performance when I wished the band was more willing to roll in the mud. Jazz is not necessarily about constant perfection; it’s about sitting in a smoke-filled hole-in-the-wall listening to raw, visceral blues at 3 a.m. after a few drinks. When the group played “Everything is Everything,” a tune that was introduced by Gardner as “groov[ing] so hard, whatever [else] you have to do is just gonna sit there,” I was hoping there would be a moment when the band members would take off their perfectly pressed, matching grey suits, roll up their sleeves, and jump into the thick swamp that is a sumptuous, slow blues. Unfortunately, that moment never came. Yes, the tune grooved hard, but not quite hard enough. During the drum solo, the band clapped a steady beat, an attempt to unleash that supposed epic groove, and audience members joined in with glee. But even then I still felt like the clapping was a little awkward—a bit reminiscent of sticking a classically trained Russian ballerina in Cruz’s famed FitChicago Zumba class at Crown. The finale was a rendition of “Blame it on the Boogie,” arranged in the style of a New Orleans brass band. About three-quarters through the tune, the band members stood up, walked around the stage brass-band-style, and simply walked off whilst playing, ending the performance with the jazz equivalent of a “mic drop” moment. The encore, a quartet performance by Marsalis and his rhythm section, was finally the Subaru moment I’d been waiting for. Marsalis casually walked around the stage while playing, serenading the lucky audience members whose seats were onstage. It felt casual, less mechanical than the previous hour-and-a-half, and I greatly appreciated the authenticity. There’s a reason Marsalis is as famous as he is, and there’s a reason the Jazz at Lincoln Center Orchestra sold out Orchestra Hall. There’s nothing more beautiful or gratifying than seeing a work of mechanical genius in its element. But at the same time, there is also a reason Subaru commercials are some of the most heartwarming on TV—sometimes it’s fun to go off-roading.